I was watching TV Patrol this afternoon when they announced that Manny “Pacman” Pacquiao will fight Oscar “Golden Boy” De La Hoya on December 6 in Las Vegas. I’m sure this is going to be an exciting boxing event and will generate millions of dollars for both boxers. Who’s going to take how much? We’ll have to find out about that later. 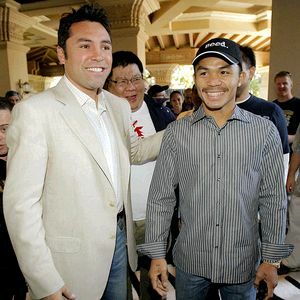 Manny Pacquiao is 4 inches shorter than Oscar De La Hoya, whose height is 5’10 1/2″. The latter is also heavier. Pacquiao said that he’s expecting that it will be a difficult fight for him. De La Hoya is out to get vengeance for all the legendary Mexican fighters that Pacquiao beat. The report said that the fight will be worth more than $100 million! Whoa! This is going to be exciting! Here’s a picture of Manny and Oscar from ESPN. OMG…that’s a lot of money^^…if I were Pacquiao or Dela Hoya I would gladly sleep at the first round already hehe…just kidding^^…It’s gonna be an exciting fight indeed! Nakakatakot po tong match na to. Malakas si Pacquiao but mukhang mas ma experience si Dela Hoya. Pero siyempre sana manalo pa rin si Pacquiao. really! you have tv patrol in korea? you get everything direct or something like ‘ the filipino channel’. so you’re updated withings back here. that’s very nice. before we used to have kbs world, mbc offered in our cable line-up now we only have arirang tv and ytn. kainis. i used to follow programs like vitamin, saving humanity on kbs world and my beloved, grammatically correct english subtitled tv dramas. now kbs world is exclusive to sky, we’re destiny subscribers. How wrong you were Reynold. I think a lot of experts thought that the size difference meant De La Hoya would win it easily. It was sad to see such a legend like De La Hoya so powerless. Hat’s off to Pac Man. He was awesome. Consolidated his spot as best pound for pound fighter.